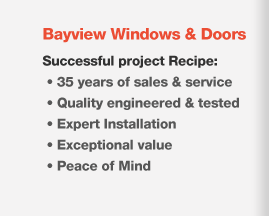 Bayview Windows & Doors offers a wide selection of window options for your home or workplace providing quality, security, durability, weather resistance, energy efficiency and beauty. Our windows are designed and constructed to match exact specifications. The double-hung tilt window has a classic colonial style in which both the top and bottom sash opens vertically. Since the panes easily tilt inward, these windows are simple to clean and maintain while they provide maximum ventilation and comfort. Bayview Windows & Doors installs the double-hung tilt windows with safety latches for security, recessed for a sleek appearance. To protect your home from foul weather we provide Energy Advantage Low-E glass, sealed units made with standard S class super spacers and fusion welded sashes and frames. We install all of the necessary hardware and accessories to make sure your double-hung tilt window system is worry free. Single-hung tilt windows offer the same classic colonial style and beauty of the double-hung tilt window. On the single-hung style, only the bottom sash opens and closes providing even more security, less maintenance and increased energy efficiency. Bayview Windows & Doors installs a fully integrated system of single-hung tilt windows, with Energy Advantage Low-E glass, standard screens, heavy duty frames and sashes, triple weather stripping and all of the necessary hardware and accessories. Horizontal slider windows provide all of the ventilation and visibility that the double-hung tilted windows offer. This option is an attractive choice for those looking for a horizontal landscape view. Horizontal slider windows bring versatility, affordability and easy maintenance. • The horizontal slider window system can be used virtually in any home or commercial space. 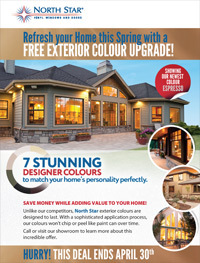 Bayview Windows & Doors will install both single and double slider options depending on your need. All installations include Energy Advantage Low-E glass, standard screens, heavy duty frames and sliders, triple weather stripping and all of the necessary hardware and accessories for enhanced safety and protection. Casement windows are an ideal solution for maximum ventilation and easy use, as they simply swing open and closed like a door. When closed they shut tightly providing a firm, lasting seal with enhanced energy efficiency, safety and protection from the weather. When opened they fill the room with fresh air and sunlight. 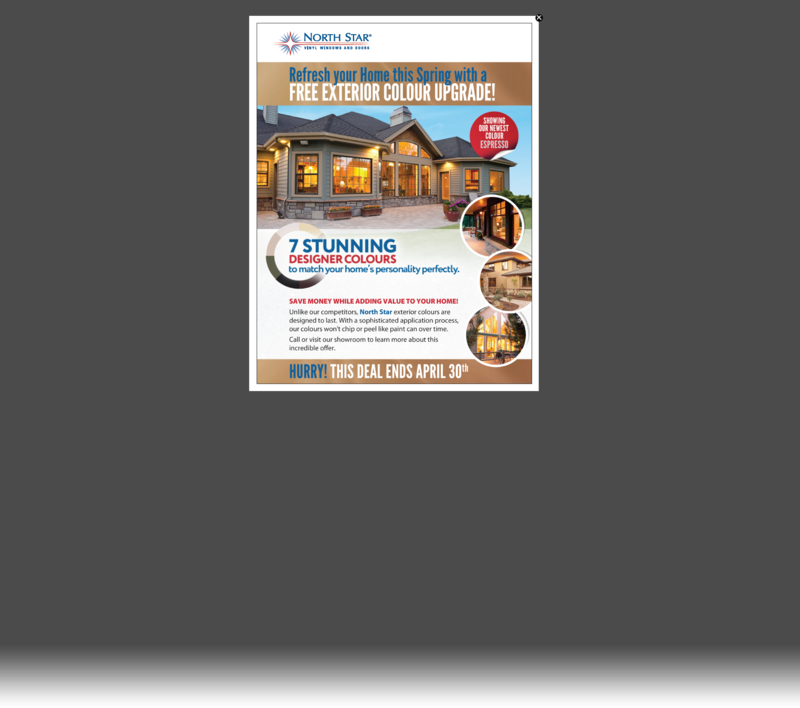 Bayview Windows & Doors installs Energy Advantage Low-E glass, standard screens, heavy duty fusion welded sashes, an exterior beveled frame, triple-weather stripping and all of the necessary hardware and accessories. Awning windows offer maximum ventilation while protecting the room from harsh weather. Hinged at the top and opening outward with a durable handle, they are often placed above or below other windows or doors to enhance lighting and air circulation. When shut the awning window provides a strong seal bringing safety, protection and peace of mind. Bayview Windows & Doors installs awning windows with Energy Advantage Low-E glass, sturdy fusion welded sashes, standard full screens, an exterior beveled frame, triple-weather stripping and all of the necessary hardware and accessories to make your windows last a lifetime. Hopper windows are often confused with awning windows and casement windows because of similar hinging mechanisms. However, a hopper window is hinged on the bottom and tilts open at the top. This system brings enhanced airflow and increased security; an excellent solution for basements, above doors and other windows. Hopper windows are typically used in tight spaces that require small openings like bathrooms which need as much ventilation as possible. Their tight seal provides maximum energy efficiency and protection from the weather. 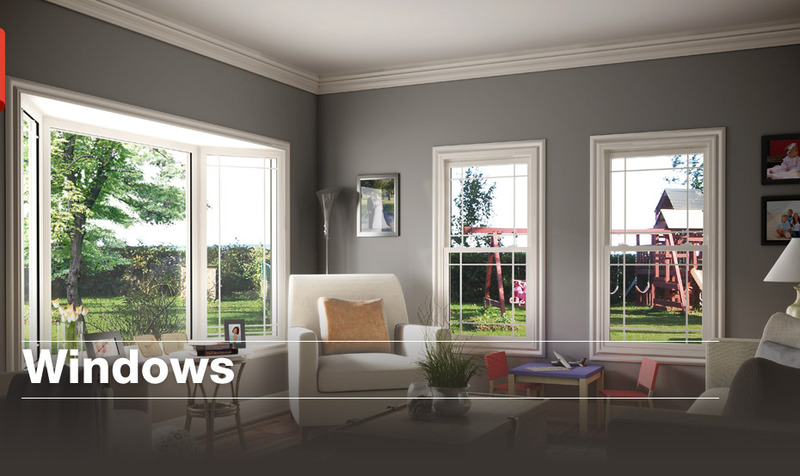 Bayview Windows & Doors installs hopper windows with Energy Advantage Low-E glass, strong fusion welded sashes, standard full screens, triple-weather stripping and all of the necessary hardware and accessories to make your installation a lasting success. Projecting outward from a wall at 30 or 45 degree angles, the bay window creates a spacious alcove or an oasis that extends the room and brings in a flood of sunshine. It is often used to create a greenhouse feeling with a ledge for plants and flowers. Bay windows are comprised of three windows made up of one large fixed window in the middle and a casement window on either side. Bayview Windows & Doors installs bay windows with Energy Advantage Low-E glass, strong fusion welded sashes, triple-weather stripping, walk-out applications, insulated and non-insulated head and seat options, a white or oak veneer finish and all of the necessary hardware and accessories for enhanced beauty and security. An elegant, gently arched bow window can make your home feel brighter and more spacious. Bow windows can be installed in most other large window openings creating a relaxing alcove that brings in a flood of sunshine. Comprised of four or five individual windows or panels, this semi-circular outward projection creates a perfect cozy ledge in which you can sit and watch the world go by. Bayview Windows & Doors will install your bow window with oak veneer head and seat boards as an added finishing touch. All installations are secure with Energy Advantage Low-E glass, durable fusion welded sashes, insulated and non-insulated head and seat options, walk-out applications, triple weather-stripping and all of the necessary hardware and accessories to make your bow window a perfect addition to the room. Custom shape windows allow you to create a style that works with the architectural look of your home. Bayview Windows & Doors installs custom shaped picture or single-hung windows in a variety of configurations and sizes, adding an artistic element to your living space. Our custom shape windows are installed with Energy Advantage Low-E glass, heavy duty fusion welded sashes, triple weather-stripping and all of the necessary hardware and accessories to provide security and safety. Picture windows are designed to maximize the surface area of glass and minimize the frame, enhancing the flow of sunlight and offering a more expansive view of the outdoors. Since picture windows are not designed to open or close, they are the most energy efficient windows available preventing air infiltration and moisture penetration. Picture windows can be combined in a series of fixed and operable windows depending on your personal need. Bayview Windows & Doors installs picture windows with Energy Advantage Low-E glass, sturdy fusion welded sashes, an exterior beveled frame, triple weather-stripping and all of the hardware and accessories to seal your home with a stamp of approval. Bayview Windows & Doors installs frames, interior grills and exterior grills in a variety of colours and thicknesses that suit the architectural look of the home. • Durable Standard Multi-Point Locking Hardware for added security and durability. • Fold-Down Handles with resting covers for a sleek look and smoother operation. • Multi-Point Locks for higher security and energy savings. • Self-locking Hardware, providing homeowners with even greater security and peace of mind. All hardware options are available in white and champagne. Bayview Windows & Doors installs a selection of efficient glass choices in order to reduce energy costs and minimize your carbon foot print. We provide a variety of options that can enhance both the beauty and performance of your window system. Triple-glazing: utilizing three panes of glass to reduce condensation and thermal transfer, while offering enhanced insulation. Bronze Tint and Grey Tint: reducing solar heat gain and visible light transmission, by cutting down on the amount of glare and heat entering a building. Self-cleaning: reducing the need for cleaning exterior glazing through a dual-action coating, using daylight and rain to break down and wash away organic dirt. Obscure (frosted and glue chip): providing an effective shield without shutting out the sun. Tempered: four to five times stronger than standard glass and does not break into sharp shards when it fails offering added strength and safety. LoE 366: providing the highest levels of year-round comfort and energy savings, by using an unprecedented triple layer of silver. Argon Gas Filled: improves energy efficiency, preventing convective heat loss (cold air moving through the window) and conductive heat loss (cold air being radiated from the window). Krypton Gas Filled: used to replace air between the glass panes, reducing heat transfer and deterring convection.